Power Inverters: It Pays To Be Prepared! Planning ahead for a possible power outage is simply proactive and wise. Hurricane Sandy of 2012 and tornadoes that ripped through Missouri in 2011 and Oklahoma in 2013 are only a few, vivid reminders of how any of us are vulnerable to storms of one kind or another that can result in lost electricity needed for things such as computers, cell phones, lighting, cooling, warmth, refrigeration and even medical equipment. 1: How can I run my sump pump during a power outage? Sump pumps come in various sizes and the most common sizes are 1/3 hp and 1/2 hp. A power inverter can operate your sump pump when electricity is lost; and an inverter/charger with a built-in transfer switch would be an excellent choice. A 1/3 hp sump pump and smaller would work well with a 1500W power inverter/charger. For higher-capacity pumps, a 3000 watt power inverter/charger would be fully capable. The sump pump would be connected to, and receive power from, the power inverter which would be connected to your battery bank and city power. The incoming AC will charge the battery(s) for you. When AC power is lost, the inverter would, by default, transfer to the battery bank. When it boils down to investing in an inverter/charger vs. repairing damages to a basement due to flooding from heavy rains or a hurricane, you can bet, the more prudent of the two choices is having a power inverter on hand! This is especially true since flood-damage coverage is not included in most insurance policies. 2: What size DC to AC power inverter? One has to take into consideration ‘start-up’ power, so if 2,250 watts are needed, as in our total above, one should double that amount due to ‘start-up’ requirements for larger demands, such as refrigerators, that must be factored in. This means the total would jump to 4500 watts. As seen on Don Rowe you would need to select an inverter that could handle the wattage as well as a power converter cable that would be able to accommodate that particular load. You would need to determine how long you would want to run 2,250 watts; and that gets into a bit of calculating. 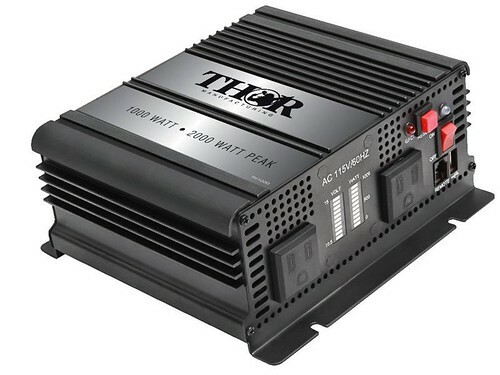 The best bet would be to visit with a power-inverter professional to get additional information and look over the various power inverters in stock. A power-supply specialist can offer tips and advice that could prove to be invaluable if the unexpected were to ever happen to you! Karen’s pragmatism continues to surface in her writing, and she a great resource on pure sine inverters. She is still enjoying her retirement from teaching in Nebraska as well. Composite Wood Blinds: Ideal Alternative For Solid Hardwood Blinds Why Choose Sash Windows For Your Home?